ALVIN R. BEATY. An eminently valued and useful citizen of Lakin, Alvin R. Beaty is not only a worthy representative of the business and financial interests of Kearny County, but is an important member of the agricultural community, owning and managing a highly improved farm adjoining the Town of Lakin, and being also one of the largest stock raisers and dealers of Southwestern Kansas. A son of Harvey Beaty, he was born in Carroll County, Missouri, January 26, 1850. Mr. Beaty's grandfather, William Beaty, a Kentuckian by birth, spent a part of his earlier life in Tennessee, from there migrating sometime during the first quarter of the nineteenth century to Carroll County, Missouri, where he settled permanently. He married Peggy Crockett, who was born in Tennessee, being a kinswoman of David Crockett, the well known frontiersman and statesman of that state. They reared eight children, as follows: Harvey, John R., Mrs. Ann Minnis, Mrs. Betsey Brock, Mrs. Clarissa Patter, William, who served as captain of a company in the Union Army during the Civil war, Mrs. Katie Silkey and James H.
The oldest child of his parents, Harvey Beaty, was born about 1812, in Tennessee. A lad of tender years when the family moved to Missouri, he was brought up and educated in Carroll County, and after attaining his majority took up land from the government, and on the farm which he cleared spent his remaining days. A true patriot, ever loyal to the interests of his country, he served in the Florida war against the Seminole Indians and in the Mexican war a dozen years later, and on account of his latter service his widow, at his death, received a pension. He was twice married. He married first Eliza Campbell, daughter of James Campbell, who went from Kentucky to Carroll County, Missouri, at an early period of its settlement. The mother of Mrs. Harvey Beaty, was named Sproul. Mrs. Beaty died at a comparatively early age, leaving six children, namely: Sashel, who died in early manhood; James W., who died in Manzanola, Colorado, in 1913; Jasper N. died at the same place in 1917; John W. died there in 1912; Alvin R., with whom this sketch is chiefly concerned; and Eliza, wife of T. B. Porter, of Garden City, Kansas. 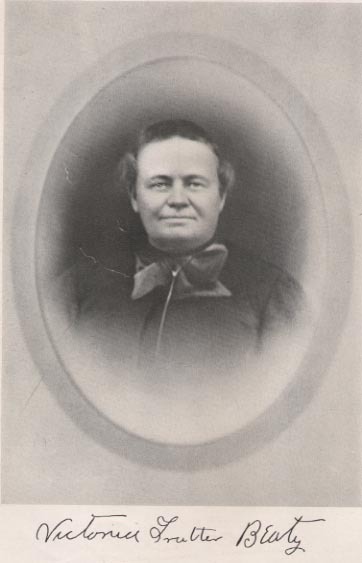 By his union with his second wife, whose maiden name was Mary Sproul, Harvey Beaty reared six children, namely: Miriam, who married Reuben Hatcher and died in Carroll County, Missouri; Joseph, who died as a child; Martha married John McClain, and subsequently died at Manzanola, Colorado; Sallie, who became the wife of John Vroman, also died in Manzanola; Emma died unmarried, in Colorado; and Robert, whose death occurred in Missouri. Jasper N. Beaty, brother of Alvin R., enlisted during the Civil war in General Stirling Price's Army, and was taken prisoner at Blackwater, later being paroled. Subsequently with three of his brothers, he went to Colorado, the greater portion of which was then in its primitive wildness, and for a time he and his brother James were engaged in freighting across the plains with ox teams. The brothers, however, remained in that part of the country, and ere many years had passed had become extensive landholders and stock raisers and among the more prominent and influential men of that region. They were pioneers of Otero County, the founders of Manzanola, Colorado, and the moving spirits in developing that part of the state into a great alfalfa and beet country. Active in financial circles, they also carried on a large banking business in the Arkansas Valley, where the name of Beaty is held in high regard, ranking second to none. Brought up in the country, eight miles from Carrollton, Missouri, Alvin R. Beaty obtained his early education in the rural schools. Starting in life for himself at the age of eighteen years, he began on a low rung of the ladder of attainments, at first renting a small tract of land which he devoted to general farming. Energetic and industrious, he met with good success in his undertakings, and later bought 160 acres of land, paying for it by working it. As his means increased he enlarged his operations, becoming a stock raiser, feeder, and dealer and building up an extensive and highly remunerative business. Disposing of his Missouri property in 1885, Mr. Beaty became interested with three of his brothers James W., Jasper N., and John W., in land lying in the Cimarron River region, and, as mentioned above, carried on ranching and stock raising on an extensive scale. In 1898 the Beaty Brothers disposed of their holdings along the Cimarron River, selling to the H. S. Boyce Cattle Company 18,000 acres of land and 19,000 head of cattle with the "J. O. and J. B." Brand. One of the ranches sold was known as "Point of Rocks," and was one of the old stage stands in the days when the plainsmen were hiking over the old Santa Fe trail, it being located in what is now Morton County. In April, 1885, Mr. Beaty located in Kearny County, entering a tract of land adjoining the present site of Lakin. As a dwelling place for his family, he having at that time been engaged in ranching with his brothers, he built four rooms of the house which he and his family now occupy, and in it settled his wife and three children. After disposing of his interests in the Cimarron Valley Mr. Beaty located in Grant County, on the North Cimarron River, eight miles from Ulysses. There he bought up old claims of absent homesteaders and pre-empters, acquired tax titles, perfecting the titles chiefly, and is now owner of 18,000 acres of land in that vicinity. He again engaged in the stock business, also becoming interested in horse raising and dealing, his brand being "T. O." on the left hip and shoulder. In the management of this immense ranch Mr. Beaty is meeting with characteristic success, his horses, Percherons, and his cattle, the White Face, being widely known. When Mr. Beaty assumed possession of his residential property in Lakin there was not a stick upon it. He has since added improvements of all kinds, and has developed it into an irrigated alfalfa farm, which is highly productive. He has also set out trees, having now a splendid grove, while his orchard supplies largely the family larder with fruit and demonstrates to the beholder the fact that peaches, plums, cherries and apples bear well in this altitude. In recent years Mr. Beaty identified himself with banking, first with the Lakin State Bank, of which he is president, and later with the Valley State Bank of Syracuse, Kansas, and is also its president. On July 21, 1874, Mr. Beaty married in Carroll County, Missouri, Victoria Trotter, daughter of William and Louisa (Tomblin) Trotter. 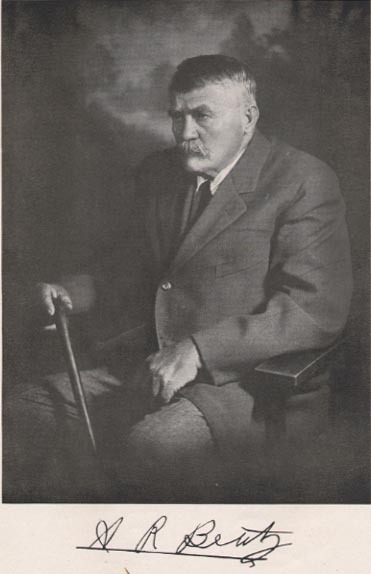 William Trotter was a son of John Trotter and Miriam (Stanley) Trotter. The latter were pioneers from Kentucky to Missouri in Carroll County, in which state William was born. They were all farmers. Mr. and Mrs. Trotter reared six children: Mrs. Ella Good, Mrs. Beaty, Mrs. Millie Bidstrup, Mrs. Mary Trotter, Alexander and Robert. Mrs. Beaty died October 12, 1910, leaving three surviving children, Russell, Ethel and Ralph. Russell Beaty, who is engaged in the cattle business, married May Towler, and they have four children, Ida, Etnah, Victoria and Russell T. Ethel is the wife of Dr. G. R. Hickox, of Satanta, Kansas. Ralph, engaged in the cattle business near Lakin, married Eva Delano, and they have two children, Ruth and Ethel. A daughter, Ida, was Alvin R. Beaty's firstborn and died when eighteen months old. True to the political faith in which he was reared, Mr. Beaty has always been identified with the democratic party, and served for two terms as county commissioner of Kearny County. He united with the Baptist Church, to which Mrs. Beaty also belonged, and has taken an active part in its upbuilding.